Inadequate chewing: chewing is the first step in the digestive process. Chew your food thoroughly! Excessive stress: stress can affect the transit time of food through the digestive tract and the necessary enzymes to break down the food. Relax while you eat! Eating the wrong foods: artificial colours, additives, sweeteners, flavours, etc. We are not designed to eat these nasty chemicals. Have fresh whole foods if you can! Inadequate amount of good bacteria in your gut: our digestive system have over 400 different bacteria, both good and bad. A healthy balance of these bacteria is essential for digestive health. Eat good quality, natural foods, plenty of high-fibre foods, prebiotic and probiotic. Gut inflammation: a nutrient-spare, artificially-based diet will inflame your gut and negatively affect digestion. You must eat a “real” foods. I’ve written on my blog before how amazing fermented foods are for your overall health. Probiotics (good bacteria) in those foods improve your digestion, boost immune system, produce antioxidants, reduce cholesterol, stabilise blood sugar levels, etc. I cannot emphasise enough how important it is to include fermented foods in your diet. Any forms should be fine. Yogurt, kefir, Kimchi, miso, sourdough bread, even wine 🙂 Making Kimchi at home is not as hard as it looks. It is cheaper to make your own than buy from the shops. You can also control the sodium level. So this is how I make! Chop the cabbage and mix well with salt in a big bowl. Let it sit for an hour until the cabbage gets wilted down. In the mean time, make a Kimchi paste. Mix all other ingredients in a different bowl. Once the cabbage is wilted, rinse and drain well in cold runny water to remove excess salt. Transfer the cabbage to the bowl with a Kimchi paste. You might want to wear disposable gloves and apron here cause it can get quite messy. Massage the cabbage really well and make sure it’s all covered with the paste. 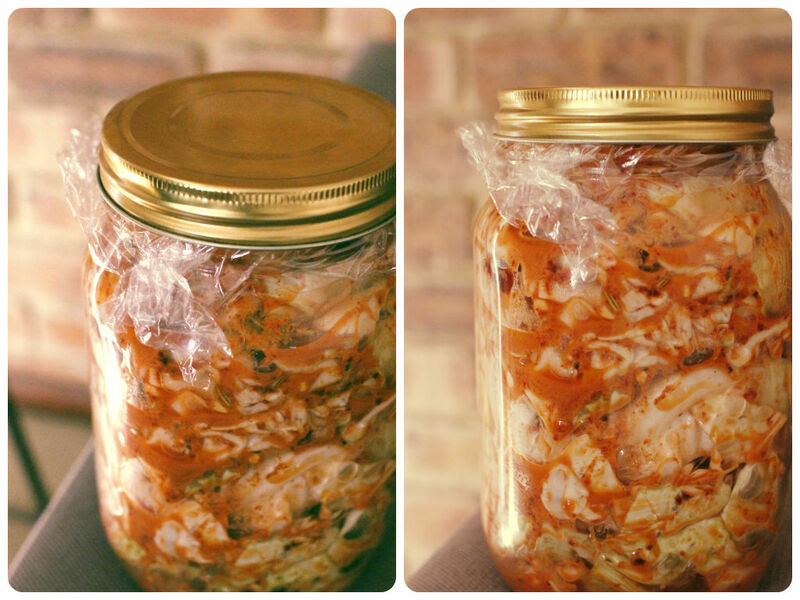 Transfer the Kimchi to a steralised jar. Pack tightly so that the Kimchi is submerged in the liquid. Leave it in room temperature for a day to allow fermentation process and then keep in the fridge.